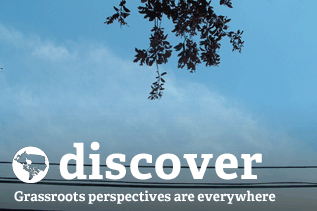 What stories should we cover this spring? What do *you* want to read about? What do Canadians need to know about? The Dominion's fortnight in review prioritizes stories posted by readers, so share links to stories we should mention! Or, post story ideas; every month we send journalists to this page to get ideas for stories to pitch. If you like a story that someone else has suggested, add your support, and any additional feedback. Many of our best story ideas come from reader suggestions and dialogue between members. Thanks for adding to the dialogue! Submitted by amund180 on mar, 04/19/2011 - 05:06. Money makes the world go round. What are Canadian banks doing with our money? What role do our banks play abroad? How can we improve our financial systems for long-term stability and community health? What effect do international banks have on Canada/BC? How stable is our banking system? With so many causes impacted by finances, is it NOT the umbrella issue/root of the problem? 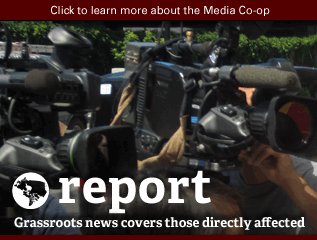 Are stories like NATO & Libya really all about oil or all about banking as globalresearch.ca suggests? Is it a conspiracy theory or a scandal exposed? What role can we play in disrupting bankers power? Alternative models? Rent ceilings? Speculation laws? Free food? Self-sufficiency? Cancelling credit, ignoring loans? 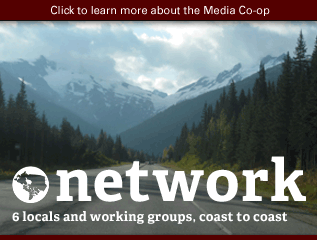 Tribal and provincial public parks? Unions? 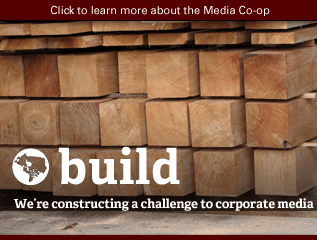 Are there successful financial disruption stories from Vancouver or else where? How other causes assist in networking, supporting, incorporating or understanding this issue? How do big banks, big-money companies affect governments and people (and vis versa) in Canada/BC ? Submitted by YreNextTrgt (non vérifié) on sam, 04/02/2011 - 14:24. NATO is taking over command of military operations in Libya from coalition forces, world media reported Sunday. Submitted by jimi (non vérifié) on dim, 03/27/2011 - 13:45. Submitted by James (non vérifié) on ven, 03/04/2011 - 15:33. I would like to read about the distribution of wealth and monetary policy in Canada. Money is the main tool of enslavement used by the elites. A better understanding of it and how it is created and manipulated is a step towards freedom. Billions of the people's tax dollars are spent on the most destructive, oppressive, and profitable industries like defense, mining, petroleum, forestry, and prison-building, while those that own the banks and corporations sit on trillions of investable wealth. Meanwhile, wages stagnate, food prices rise, health care and quality education crumble like our infrastructure. Also our lack of a secure and sustainable organic food system is a major problem. What can we do to get at the root of the problem? Submitted by Vancouver Anonymous (non vérifié) on mar, 03/01/2011 - 15:37. I would like to here about the cause of canadians mining in Peru. Submitted by Moira Peters on dim, 02/20/2011 - 14:20. Jorge Vinicio Sosa Orantes is one of 17 former Kaibiles, a Special Forces unit of the Guatemalan army, charged in relation to the massacre of Dos Erres in the north of Guatemala. In 1982, 252 unarmed civilians were brutally and systematically killed, their bodies dumped in a well. This massacre occurred during the 36 year Internal Armed Conflict in Guatemala, where more than 200,000 individuals were killed and over 650 massacres were committed. He is currently being detained in Calgary, AB. based on a request from the United States, which is seeking to try him for naturalization fraud. Mr. Sosa Orantes has a bail hearing on February 23.The Maritimes-Guatemala Breaking the Silence Network and other human rights groups believe bail should be denied based on the severity of the charges against Mr. Sosa Orantes. Full PR on the MC site. Submitted by SandraCuffe on ven, 02/18/2011 - 11:32. Cheyne, from Sedgefield, County Durham told The Northern Echo: 'I phoned the police to complain and they said “for all we know you could be Bin Laden's brother”'. Ok, there's the whistle again. Breaktime over. Submitted by SandraCuffe on dim, 02/06/2011 - 21:08. See this LA Times blog post of Feb 4th re "Egypt: Pentagon moving warships, preparing for possible evacuations"... It has been noted elsewhere that the "Kearsage not only transports and lands ahore troops, but also tanks, trucks, artillery, and the complete logistic support needed to supply an assult..."
...and that the LA Times mention of the Enterprise in the Mediterranean is notable since "The Enterprise is the longest naval vessel in the world, and is powered by eight nuclear reactors. The Enterprise does not appear to have any dual role for evacuations, but is simply an offensive aircraft carrier." Multiple platoons of the US Marines also deploying, according to a questionable "source" cited in the Business Insider, also of course "to evacuate US citizens" - haven't checked to confirm this elsewhere, but would def be good to include in the FiR if it's true, esp if #s/stats come out about the US military involvement. I mean, how many USians can really still be in Egypt to need a huge military assault warship?! At least the Marines are noted for their historical respect of other countries' sovereignty and popular movements! Submitted by Anna Luisa Daigneault (non vérifié) on jeu, 02/03/2011 - 17:18. Hi, I would love to do a story about the Canadian oil companies currently exploring and extracting oil and gas in the Amazon region. The industry affects tribal peoples in many ways, and is also troublesome for isolated indigenous groups that have not had contact with the outside world. when is the deadline to submit a piece for this issue? Submitted by Moira Peters on mar, 02/08/2011 - 08:59. 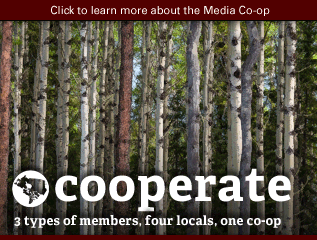 You can post a story yourself on this site -- the Media Co-op -- any time. 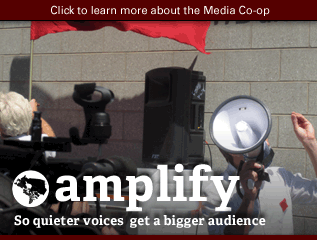 You first need an account; request one from info@mediacoop.ca (it's free). You can also pitch a story to the Dominion for pay. The deadline for the next round of paid pitches is March 1. 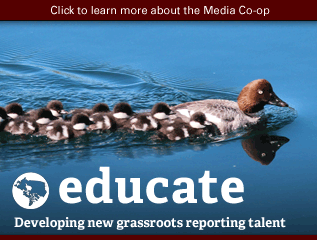 Paid stories need Canadian content. You can submit a pitch any time. 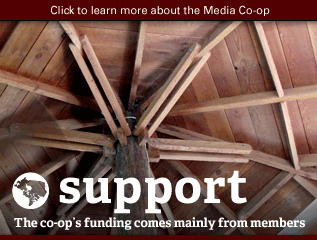 You'll need a Media Co-op account to do this as well: http://www.mediacoop.ca/index.php?q=node/add/pitch. 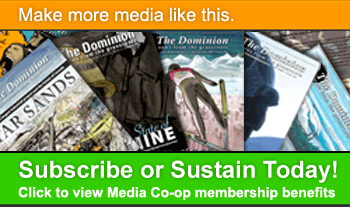 If you want to submit a story to the Dominion not for pay, you can also do that at any time; email info@mediacoop.ca for more info or to simply submit your story. 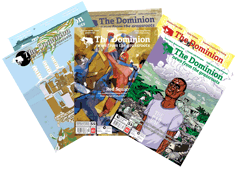 Guidelines for writing a story for the Dominion can be found here: http://www.dominionpaper.ca/write.